"An older gas-powered lawn mower pollutes as much in one year of typical use as a new car driven more than 86,000 miles,” according to the South Coast AQMD. Egad! 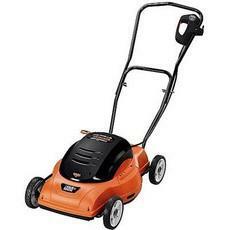 Don't even get me started on gas powered string trimmers. Using an electric mower eliminates the majority of that pollution. While it is true that electricity might be generated from fossil fuels, and thus create some pollution, it is both less pollution and better pollution. That is, it is easier to apply new, cleaner technology to one smokestack than three million lawnmowers, and even a coal-fired power plant is cleaner power for the job than a small internal combustion engine. In addition, if you have solar cells or sign up for "Green Power" in jurisdictions that offer it, you have effectively eliminated three month's worth of car exhaust from that ol' smoker. Amazon and Home Depot, among others, sells a number of corded and cordless electrics, such as the Black & Decker model to the right. In some jurisdictions you can even turn your ol' smoker in to the local Air Pollution district and get a $40 0 cordless electric for just $100. The beauty given away in SoCal is also shockingly quiet, thus eliminating another environmental degradation not frequently mentioned, noise. Alas, the 2005 program in SoCal is oversubscribed, but watch www.aqmd.gov for the 2006 giveaway times. 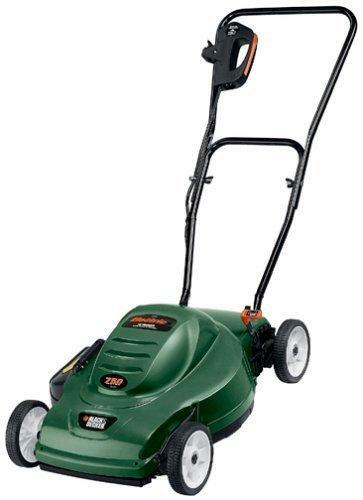 We really love our cordless AQMD provided Neutron (tm) mower, do not miss the ol' smoker (or its roar!) and think it is worth every penny of the $400 it would set you back bought from the manufacturer. I was all set to post a comment on the evils of push mowers (we tried one, and it just didn't work, plus it was a huge PITA. my dad made me mow the lawn every time, since it was my idea, and we soon all abandoned it). But now you've given me the alternative of an electric mower. I'm totally going to sell my parents on one when they move. Glad to hear you are sold! 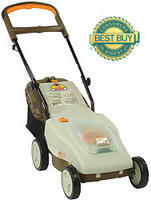 The Neuton is lighter and more maneuverable than an internal combustion mower. It is totally worth it to go to their website and request the info, which, I believe may include a video. By the by, I agree about the push mower -- green, but not Easy Green. Hey Kermit hater -- kidding ;) Luckily(? ), I'm lawnless, more or less, as an apartment gal -- Thanks for the challenge posts -- Always entertaining! If you want to reprint with proper attribution (URL, Author, etc) with "Used By Permission" that's fine; if you want to link to the blog, each article has its own link, and that's fine too . . .